Atlas has recreated the MP15DC in N, HO and O scales. Here is the HO version. Conrail's MP15s were leased by the Reading for use on branch lines in the anthracite coal fields. The MP15DC was one of EMD's last switcher offerings. The MP15DC succeeded the SW1500 in EMD's long line of "switcher" locomotives. With the operating cab located at one end of the frame and a lowered long hood over the engine, these locomotives provide much better visibility for the engineer when working with the rest of the crew on the ground during switching. Like the SW1500, the MP15 series was designed for both the traditional switching assignments found in freight yards and industries as well as light over-the-road duty. 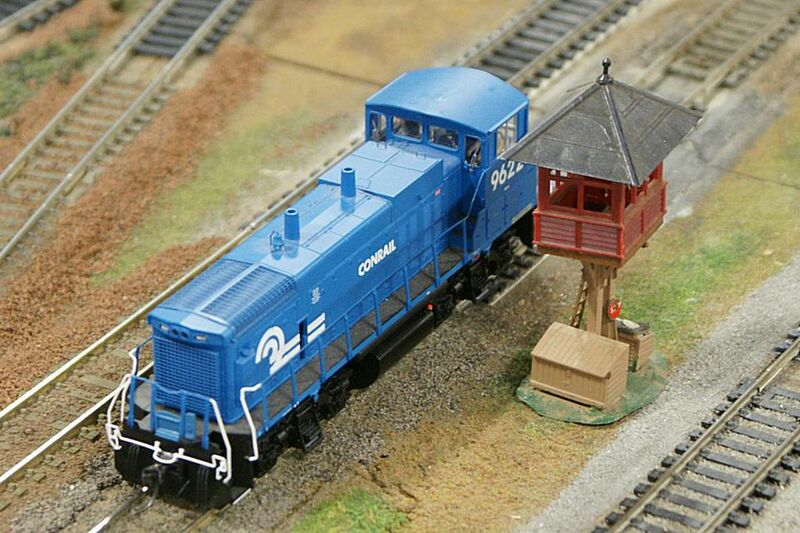 This made them well suited for branch lines, yard transfers and locals. Although rare, they could even pinch hit on regular road freights if needed. The MP15DC was very similar in appearance to the SW1500, only a little larger and boxier. Befitting their road switcher status, all MP15DCs rode on EMD's Blomberg B trucks instead of the AAR or Flexicoils used on SW1500s. When first introduced, the MP15DC was known simply as the MP15. In 1975, EMD introduced the MP15AC which used an alternator instead of a generator. The MP15DC designation was created at that time to distinguish the two. Unlike later locomotives which use AC traction motors (like the common SD70ACe), both the AC and DC versions of the MP15 use DC traction motors like the GP38AC introduced in 1970. Production of the DC version continued until 1980. The last of the MP series was delivered in 1984. These were the final examples of the switcher type from EMD. With the youngest units now at least thirty years old, many are nearing retirement age. Locomotive leasing companies like Larry's Truck and Electric (LTEX) have been purchasing many of the units as the large railroads retire them. There is a lucrative secondary market for leased switching engines at many large industries and even short lines. It appears certain that although the production years are long behind us, these switchers will continue to work hard for years to come. The MP15DC has been reproduced by manufacturers in several scales. The list of models below is specific to just the MP15DC itself. MP15ACs could be a logical starting point for a kitbash in other scales or could simply be used as a stand in. An SW1500 could also yield parts if no MP15 is available.